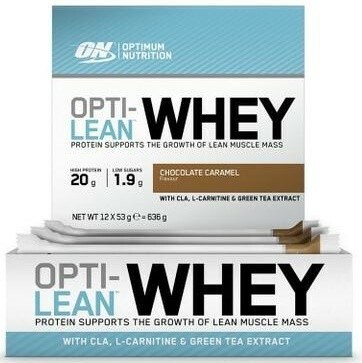 What is the Optimum Nutrition Opti-Lean Whey Bar? Protein bars are designed to offer a convenient solution to help you meet your protein requirements, and make a welcome alternative to your regular shakes before or after training. Achieving your fitness goals can sometimes be a balancing act, and requires you to stay one step ahead. It’s about making informed choices regarding exercise and nutrition – and this is where the Optimum Nutrition Opti-Lean Whey Bar comes in! As is signature to the Optimum Nutrition brand, each bar delivers 20g of high-quality protein to support lean muscle growth and repair. With just 1.9g of available carbohydrates, the Opti-Lean Bar can help you to stay on plan; because it’s high in fibre, you’re apt to feel sated for longer. Other featured ingredients include conjugated linoleic acid (CLA), l-carnitine and green tea, which have been shown to assist energy metabolism. With an Opti-Lean Whey Bar, you’re getting satisfying nourishment that will aid in curbing cravings. Enjoy as a delicious yet healthy, ‘clean’ treat, or consume around your training to boost recovery. What’s makes its formula special? Each Opti-Lean Whey Bar provides 20g of muscle-building protein. Low in sugar; you’ll find just 1.9g of available carbohydrates per 53g serving. Formulated with CLA, l-carnitine and green tea to support weight management. Ideal post-workout. Can also be savoured as a guilt-free treat/snack, or used to bolster to your protein intake at any time of day. Available in truly indulgent flavours to suit all tastes! Individually wrapped in a multi-pack to help you organise your meals and snacks. How can the Opti-Lean Whey Bar help me reach my goals? Good nutrition and solid training form the basis of your success, but throughout, life happens. That’s why it’s good to be prepared with sensible options at your disposal! The Opti-Lean Whey Bar offers a helping hand to anyone looking to improve their body composition, and remain watchful of their carbohydrate intake. Specially selected ingredients in the Opti-Lean Whey Bar are designed to reinforce your exercise and dietary habits, so that you can triumphantly reach your targets! Who is the Opti-Lean Whey Bar suitable for? Individuals following weight management or get lean programmes. Bodybuilders in search of a low-carbohydrate, nutritious snacking option in the run-up to competitions (or on any given occasion). Anyone who’s active, and wanting to make healthy, sustainable changes to their lifestyle.